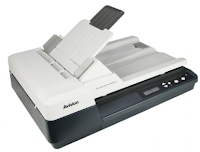 This Avision AV620C2 + Scanner is a Compact and Affordable Document Scanner by Combining a 50-page automatic document feeder with flatbed A4 scanning. This scanner is equipped with CIS technology and has an optical resolution of 600 dpi. Simple AV620C2 + operation with exclusive Avision software application, Button Manager. Users only need to place the document on the scanner correctly, then press the Scan button.